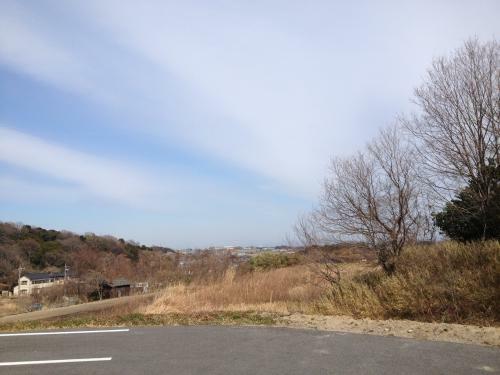 It is very warm today like spring. But the flu is going around in town. A lot of dancers who entered the Asian Open Dance Championships last week have had the flu, and cannot enter the championships this weekend in Taiwan. I have also heard some people who went to Nippon Budokan to see the Championships caught the flu as well. 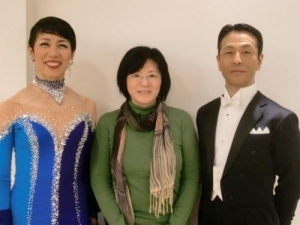 Yoshi and I will enter the East Japan Ballroom Championship this weekend, Sunday 2 March. 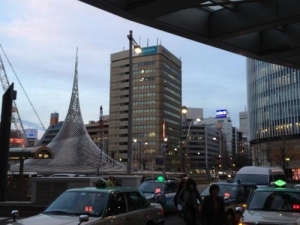 The venue is "Tokyo Metropolitan Industrial Trade Center (Taito-kan)" in Asakusa. and the final will finish at around 17:00. My object will be to concentrate on myself. I tend to be distructed by the competition atmosphere. This time I will focus on my own dancing and dance as usual as possible. The advance tickets can be obtained by request. 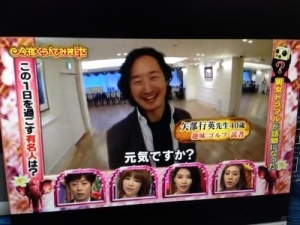 Did you watch the Nippon TV program yesterday? A star talent spent a day with a small camera on her forehead. 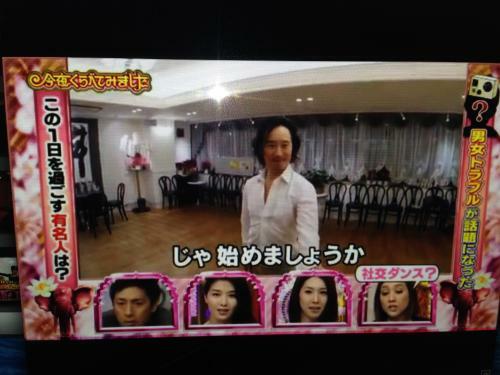 Watching the image through the camera, the TV casts guessed who the star was. Amano Dance Academy appeared in the program. The host was Yukihide Yabe, who teaches at ADA part-time. It seemed difficult for the TV casts. 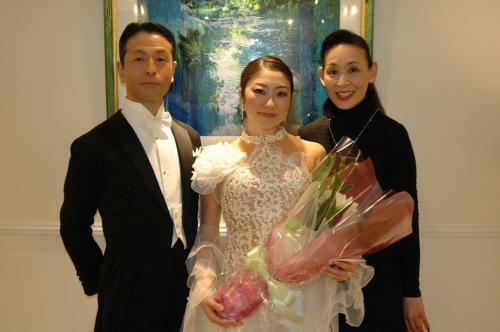 Dance lovers may find it easier as they may know that Marcia had danced with Yukihide in a TV program before. If you have missed the program, please see the link above. Many people joined and enjoyed dancing, imprompt competitions, and now a routine Samba training session. 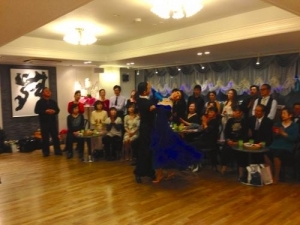 An amateur debutante, Akiko, danced Waltz with Yoshi. 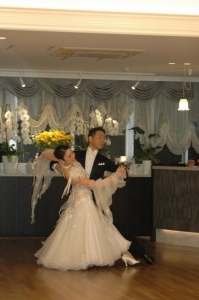 And, Yoshi and I danced Quickstep and Waltz for a professional show. The Next SNP will be on 22 March from 18:00. Aya will dance for us in the show. 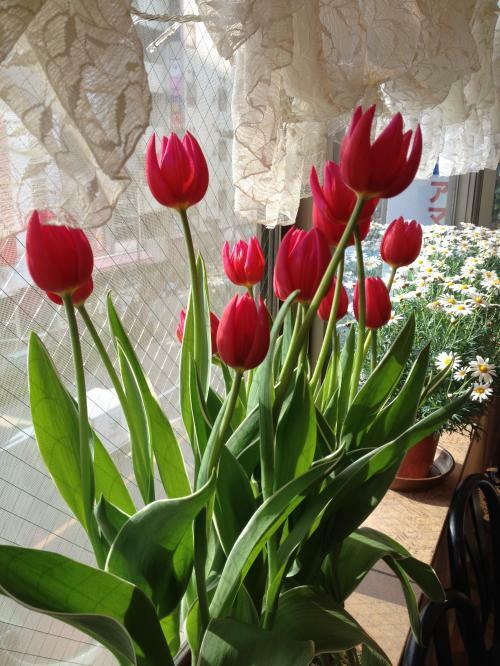 The tulips in the studio have opened up. Only 5 days ago, they were still in tight buds. 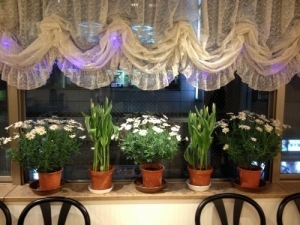 At a glance, those tulips seem still, but in fact, they are growing fast. They are substantially taller than last week. I wish my dancing were improving that fast. However, I think dancing is not like annual herb which grow, flower, and die fast. It is, like a big tree, growing and maturing slowly taking many years. 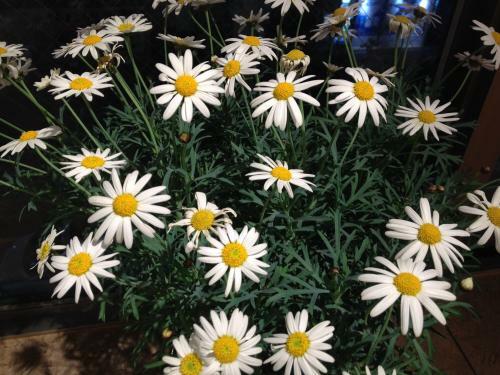 It grows in summer but go through tough times in winter. But gradually and steadily it engraves annual rings, and develops bigger and firmer. Do not surrender in winter. Keep on trying, and you will be surprised how far you have come! Tomorrow, our studio will appear on TV. We had the February Saturday Night Party today. A lot of people gathered and had great time. 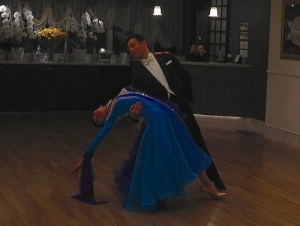 Yoshi and I danced Quickstep and Waltz for the professional show. I wore a lovely new dress from Kyoko, and was very happy to dance in it. I will upload some photos form the party in a few days. 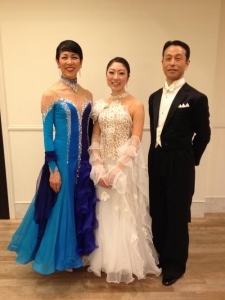 With Akiko, who danced Waltz with Yoshi during the amateur demonstration time. My old friend, Kiyoko, came to see us. I was surprised to know she used to take Yoshi's lessons before. what if he had only one year ahead of him to live. he would go to England and would dance the rest of his life. He has been dancing for over 20 years. After such a long time, he still wants to dance for life. His words made my heart so warm inside. I read a novel which recently received a literary award. Immediately after that, I read a short story written by a famous author. Both were rather simply narrated from a first-person perspective. I presume the prize awarded author invested enough time in contemplating, and plotted the novel finelly and carefully. On the other hand, though I am just guessing, the famous writer may have written the piece fairly quickly as one of his contributions. the latter has a convincing weight in it. It is something beyond good or bad, but the difference in color deepness between a fresh person and an expert. Beginners look thin like penciled drawing, even though they follow the fundamentals carefully and tidily. The drawing will become sharp and thick by practicing the same steps so many times. That is the result in excellence and experience. Saturday Night Party is just two days away. 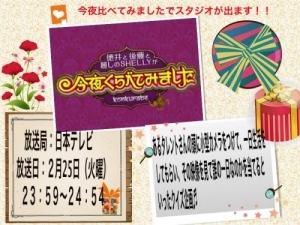 Yoshi and I will dance Waltz in the professional show. Wishing to dance deeply colored and sharply trajected Natural Turns. 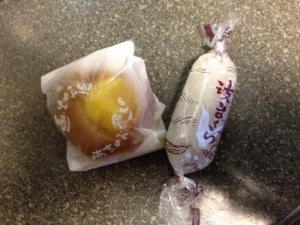 In my home town, I got some local sweets. As they are rarely seen in the other areas, I introduce some. Photo 1: "Soft Sembei (Cracker)"
Although it is named "Sembei (Cracker)", it is not cracker at all. It is sweet and a bit like soft rice cake with unique elastic texture. I have been eating this since I was very little, but for other people it must be very rare. 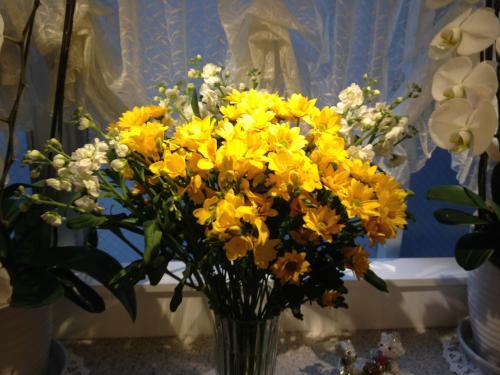 There are some in the studio, so please try them if you like. 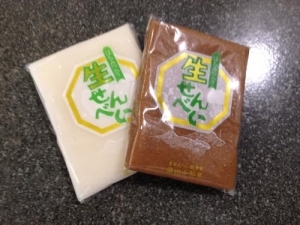 Photo 2 Right: "Nami Makura"
It is a product from the South Chita area. 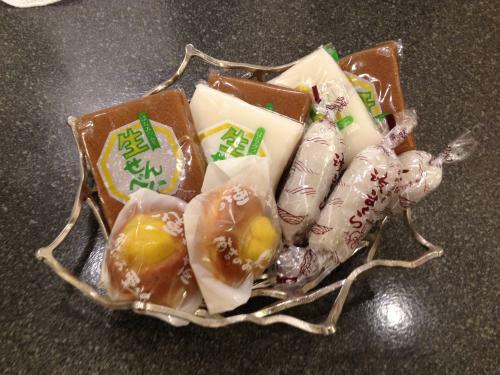 Bean-paste filled soft and thin rice cake about the size of a thumb. Photo 2 Left: "Gift from Nankichi"
I had never seen this when I was a child, so it is probably not a traditional product. Nankichi was a famous children's literature author who wrote "Gon-Gitsune (Fox named Gon)", and was from Handa City in Chita area." Steamed bun with a chestnut on top. Though such a small town, it has quite some specialties. Then remembered that he had passed away long before. I took a day off and visited my home town. I used to go there by car, but this time I went by train. The first thing I noticed was the local intonation people spoke with there. I did not really think it was that diffrent. Also I was surprised to see the train station and the town were so small and quiet. I never thought of these things when I lived there. I thought I was speaking fairly standard Japanese, and although I knew it was not a huge city, I thought the town had a certain scale. I am not saying it is good or bad, but I was simply so surprised. Maybe I am so slow to realize.